I’ve just returned from Vegetarian Summerfest – and there is SO much to tell you! For starters, I was thrilled and honored to be invited to present at this by-invitation-only annual event in Johnstown, PA. I’ve heard about Veg Summerfest for years and always had my eye on it – and it delivered more than it promised! So many highlights to share. The video of Dr. Michael Greger above was filmed during the final evening program on Saturday July 6. Each year, Dr. Michael Greger debuts his annual Health Research Overview at Summerfest – and this one had the audience hanging on every word. Dr. Greger was extremely accessible all week, answering questions and being entirely affable whether during early morning walks on the trails on the Johnstown campus or at meals. Oh, the meals! Mark Reinfeld was the master chef, calmly afloat at each repast and frankly we marveled at how he did it. ALL the food was vegan, yet within that realm there were several options: the gluten-free section, the oil-free section, and the raw section. In addition to two fully stocked salad bars. And dessert every night. I offset the indulgences with early morning interval training on the beautiful campus trails (20 minutes), Fit Quickies peppered throughout the day, and lots of walking between venues. 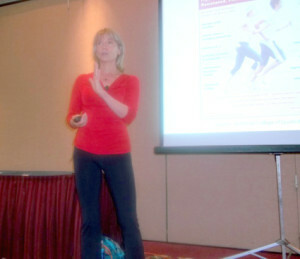 I know it’s not the best picture of my 5 Minute Fitness Solution presentation, but I couldn’t resist sharing this ‘pope pose” snapshot. There are now hundreds more people sneaking in Fit Quickies in line at the supermarket, in airport terminals (or on the plane! ), creatively breaking up desk tasks with movement, or throughout the day at home – keep an eye out and don’t be surprised if the person in line next to you at the movies is practicing “7 Seconds to a Flat Belly’ or ‘Higher Assets’, or the Willpower Workout! (see Fit Quickies, page 185). John Pierre (best known as trainer to Ellen DeGeneres) asked me to part of a fitness panel Q and A moderated by himself and featuring the fabulous Rich Roll, author of Finding Ultra. This was, to say the least, quite an honor and for a solid hour we answered questions about fitness and plant-based diet. Hard to get me to stop talking about this combination, I admit! I tried not to mess up too much in Chef Aj’s kitchen domain after shattering the garlic press! First day of Summerfest, Chef AJ and I FINALLY had a chance to meet in person. As you know, she has twice been my Teleclass series guest, and though we’ve corresponded for years, this was the first face-to-face and it didn’t disappoint. I had the pleasure of helpingChef AJ prep for one of her cooking demonstrations – and promptly broke the garlic press (! ), which is why you see me chopping garlic the old-fashioned way in the photo. It didn’t hurt that authors were treated like royalty – at least it felt that way to me – and every evening we had the option of a book signing session, which I did each night. This to me was so much fun because it was an opportunity to connect one-on-one with what people are looking for with their health and fitness. The book signings took place in the bookstore of the Student Union on the Johnstown, PA campus – and what a collection! I came away with a few new titles myself. 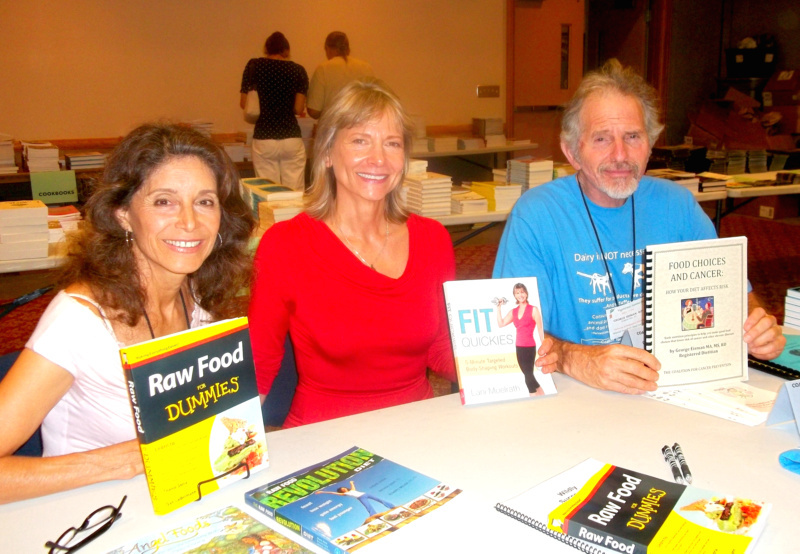 In this picture I am seated happily between authors Cherie Soria, renowned vegan chef and founder and director of Living Light Culinary Institute, and George Eisman, R.D., Nutrition director of The Coalition for Cancer Prevention Through Plant-Based Eating. I learned that there are more playing on the plant-based team than ever before. And though there may be slight differences of opinion within that realm, these are minor and staying focused on the central message is key. That is what Summerfest underscores more than anything. I learned that raw food can have flavor like you might never have imagined! That – in the words of my friend Jill Nussinow, the Veggie Queen, you can never get too many hugs. 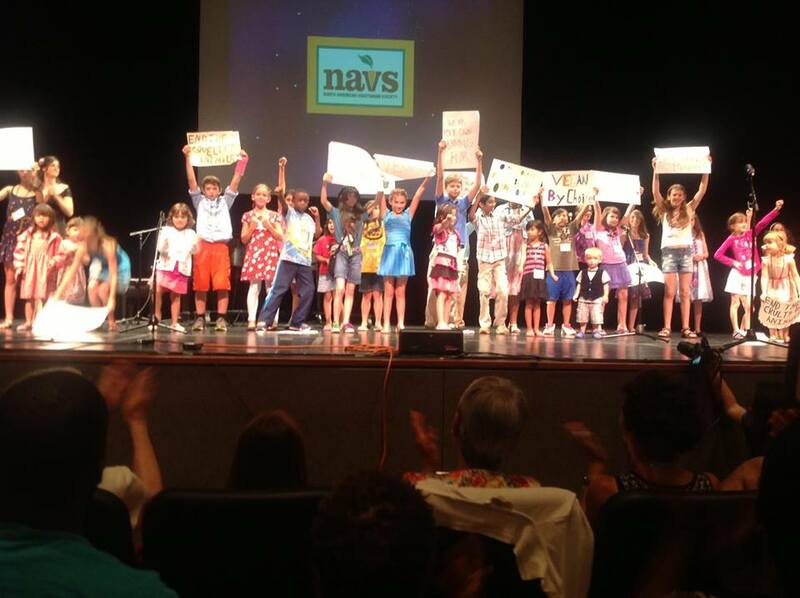 That there are children all over our country growing up healthy, strong, and vitally happy with plant-based diets – they were present in abundance, and even sang for us the final evening show. I learned that there is a family and friends in Maryland who would adopt me if I were without a home – for they did during this week, making welcome space for me at their crowded table every meal and even offering to put me up for as many days as might be needed at their home in Maryland as my flight plans were delayed with the concurrent air crash at the San Francisco airport, to where I was destined to return. Thank you to Sharon and Dave McRae and their adorable children, and Michael Taylor for your generosity and hospitality! The tennis pro circuit hit Veg Summerfest! I learned that Mary McDougall travels with Dr. John McDougall now whenever she can, and was in the audience during Dr. McDougall’s speech – even though they were only it town it seemed for a little over 24 hours! And I learned that I could listen to Brenda Davis, R.D., all day long. I learned that there are more reasons than ever before to embrace a plant-powered diet, shun the animal products, and move your body. It’s that simple. A tennis pro circuit team dropped in on the Fitness Q and A with Rich Roll, John Pierre and myself – and then hounded me for photos after (photo right). I felt like a celebrity! With Dr. Hans Diehl after a lovely dinner together. Totally charming! And every time I get a chance to hang out with Dr Hans Diehl (left), I’ll take it. 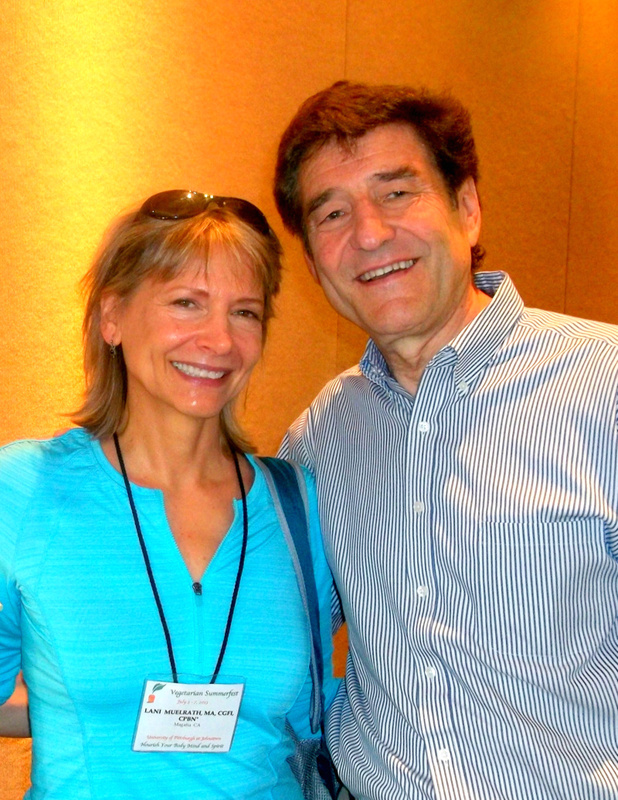 Hans has been a tremendous source of inspiration since I started presenting for CHIP several years ago and has provided unbridled support for the Fit Quickies book and my work in the plant-based health and fitness world. This event proved to be no exception. You can catch Howard Jacobson’s podcast interview of yours truly on his Whole blog at Wholevana.com – and watch for the Whole book giveaway coming up soon right here! There’s so much more to tell – hopefully the pictures help fill in some of the gaps. I promise more soon! I also had the opportunity to spend big chunks of time with Howard Jacobson, co-author with T. Colin Campbell of the new book Whole. 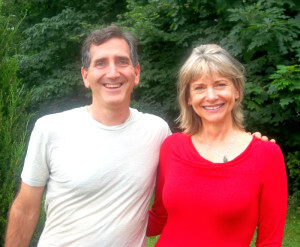 I’ll be posting an interview of Howard – a new Fit Quickies fan! along with a giveaway of a copy of Whole quite soon, so stay tuned! 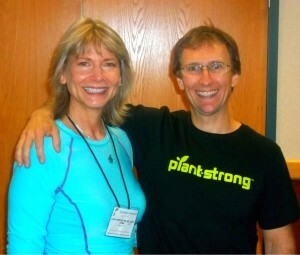 Just two days ago I was honored to be Howard’s guest on the Whole podcast series at Wholevana.com – talking about all things plant-based fitness and the magic of Fit Quickies, of course! Until then, click here for more pictures on my facebook page in my Vegetarian Summerfest Photo Album. The children of Veg Summerfest in exhuberant, completely charming performance on the last night of the event. Sharon – what an absolutely lovely first thing to see this morning – your note! And what a treat to finally meet you and your beautiful family at Summerfest – the honor is all mine! Your enthusiasm and genuine joy of helping others find their way to health is inspiring and infectious – keep up the fine work! Anna, you would have loved Summerfest! I’m glad you enjoyed the pictures and report – I guess I had to represent so many of us there, happy to do so! AJ, you’ll be glad to know these hands are now registered with the United States Govt. Hey, do you or anyone know if grip strength is an Olympic Sport yet? Lani… Thank you for posting the video of Dr. Gregor speaking. I enjoyed it so much!!! Sheri, isn’t it a winner? So glad to be the messenger to bring this treat to you!